While most are still enjoying the summer of 2014 the fashion industry is looking ahead to the next spring/summer season. The Concepts: If we were to describe Copenhagen Fashion Week with only two words, it would most definitely be sporty chic. The influence of athletic attire is not something new, but at the Danish fashion scene it became elevated through materials and their different combinations. It was most clear at Ganni who took classic sporty pieces from the tennis court and reinterpreted them into fashionable staples. Lovechild 1979, on the other hand, also introduced luxurious active wear with a feminine touch. Silky dresses and skirts reminiscent of the 1930s were combined with caps and tennis shoes creating an interesting juxtaposition. There was also a great deal of tailored elegance to be spotted at many of the runway shows. 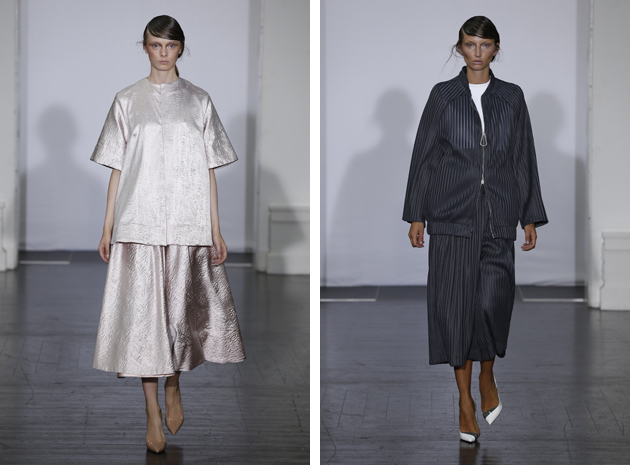 At Mark Kenly Domino Tan classic feminine silhouettes running down the runway brought to mind both the works of Oscar de la Renta, as well as those by Raf Simons for Dior, while managing to keep his own originality. 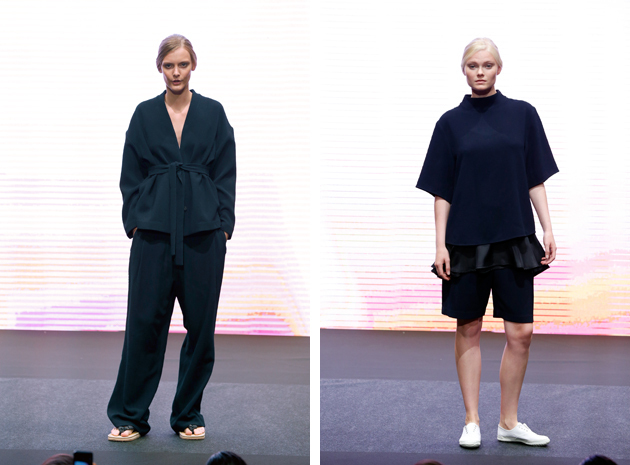 Voluminous dresses and tailored sportier pieces were shown, creating an interesting story that you never wanted to end. The Prints: There weren’t any real color codes for the season. Rather, all colors were allowed with a preference towards basics, such as navy and beige: we are in Scandinavia after all. The interesting take came from different prints, a navy dogtooth as well as floral prints at Baum und Pferdgarten and brush strokes at Freya Dalsjø. Interesting prints that preferably should be worn both on top and bottom to create a harmonious look that catches the eye. The Materials: Echoing the trend of transparency both Stine Ladefoged and Maikel Tawadros used mesh netting as an overlay giving the transparency an edgier touch and also saluting the cut out trend without being too obvious. It was used on both skirts tops and dresses as the prefect partner in crime to otherwise simplistic silhouettes. The Accessories: The flat shoes are continuing their reign, as at almost all the fashion shows you could spot a white sneaker or tennis shoe perfecting the outfit. Creating contrast and supplying comfort, the white sneaker has the light easiness of spring while still supplying the sporty comfort that appeared to be the essence of Copenhagen SS15. As a counterpoint, the interesting geometrical jewelry at Veronica B. Vallenes added to the simplistic minimalism giving the look a desirable fashionista twist. Circles of silver and gold glittered in the spotlights, featured both on necklaces and as hairpins, creating a futuristic feel for these minimalistic attires. The Techniques: Pleats have the unique quality of being both edgy and romantic. This was showcased at Designers Remix whose subtly colored finale pieces were flowy and romantic. 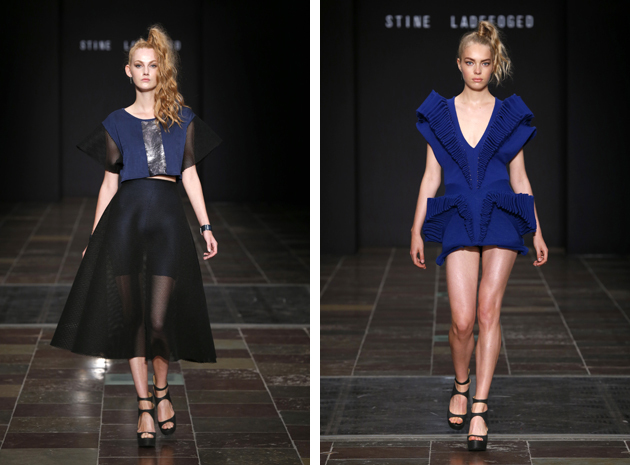 The pleats were featured all over Copenhagen in all kind of materials and were a definite favorite among designers. Another over-used technique was the fringe. 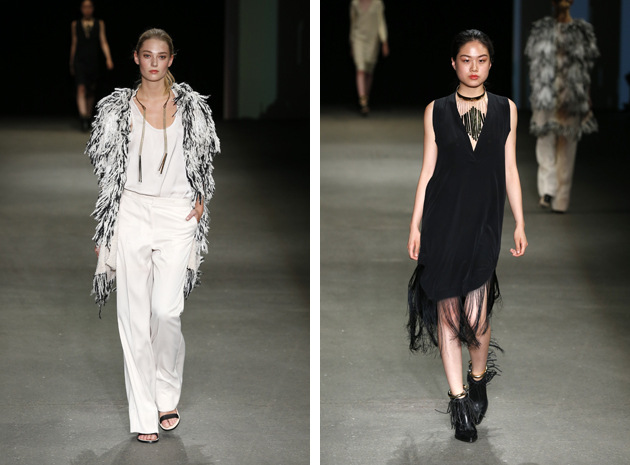 Fringes could be seen everywhere from shoes to bags and, of course, included in garments seen at By Malene Birger. The movement of the fringe creates a playful dynamic that turns even a simple design classic into a piece of the moment.